Was thinking his 2 hits from yesterday would'e gotten him the start today. Guess not. Schebler and Duvall both homered so it’s not like Winker outdid either of them and Price wants to continue rotating evenly. If tomorrow he runs out Duvall/Hamilton/Winker tomorrow that would give all four guys 3 starts. Seems to be his plan until there is a decent in season sample size to work with. Picked him up off the WW to replace Suarez and he is out of the lineup due to illness. No one can convince me that there isn't a fantasy baseball higher power that loves to f*** with us. Welcome to my world. All fantasy sports for that matter. is Winker someone good to buy low? 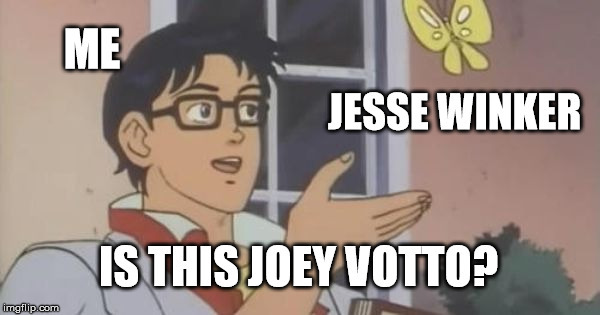 he has 0 HR and 0 SB. he has 37.0 hard hit%, which is great. he has 38.8 FB%, and of course 0 HR/FB. he has 15.1 BB% and 16.0 K%. I think Jess Winker is a good MLB player but I don’t see him having enough upside to bring major fantasy value. Right now he is on the waiver wire in my 16 team league. Basically, I see him as a guy you can pickup and plug in when the DL bug hits. Also, Cincinnati loves to platoon their OF so he isn’t necessarily an every day starter anyway. still available in a 16 team surprises me. I don't know if he has good (20ish) power but he should at least have double digit power. plus I think he has either been batting 1st or 2nd with the Reds and with his BB/OBP he should be good for R along with a good AVG. Been heating up the past week and faces all RHP this week. Starting him in my 15 teamer. Does this guy do anything other than walk and get singles? Yeah, he sits against lefties. Sure... if you're batting .500 with singles you'd have a .500 SLG. But you could also just see that .500-.309 = .191 and that's a pretty damn strong ISO. Another HR tonight...why, again, is he not getting everyday at-bats on this team?!? There are a few reasons that the Reds are juggling their 4 primary outfielders. Winker is not great against lefties. He is a pretty bad fielder. The Reds probably want to trade Adam Duvall or Billy Hamilton and benching them would suppress value. Scott Schebler’s all around game is just as good as Winker’s. I know it’s an age-old question but how else can you improve versus lefties unless you get more opportunities to face them? And don’t we all know at this point what both Duvall and Hamilton bring to the table? I get that, but those are the reasons from an organizational standpoint. Also it doesn’t really matter that we as fantasy players what guys “bring to the table” the reality is that teams can get more from a player if they are on a hot streak and there’s no way for a guy to heat up on the bench. It was a common theme predraft, and I think it still applies now. Winker’s talent will eventually win out. Wish it wouldn’t have taken this long, but via trade or other’s poor play, Winker will have a full time OF role this year. Currently 41 walks to 40 strikeouts, .270 AVG and .383 OBP. - Again he walks more than he strikes out which is amazing considering his MLB experience level. - He has elite plate discipline metrics including a 5.7% swinging-strike rate (MLB average is 10.7% this year) and a 92.1% Z-Contact rate (MLB average is 85.5% this year). - He currently has a 13% soft contact which ranks 25th best in the majors. - He currently has an above-average 90 MPH avg exit velocity which ranks in a tie for 82nd best with Anthony Rizzo, Yonder Alonso, Edwin Encarnacion, Aaron Hicks, and Yan Gomes and ranks ahead of names like Freddie Freeman, Carlos Correa, Rhys Hoskins. - His launch angle is pretty solid too with a 24% LD rate, 41.3% GB rate, 34.7% FB rate. There's more power to get with more flyballs but he's not pounding the ball into the ground consistently like Eric Hosmer. - Uses the whole field well which helps him support a quality BAPIP. - xBA of .281 and xSLG of .475 compared to his actual BA of .277 and actual SLG of .403 suggests that he may regress positively to the mean going forward. I think he's a guy worth picking up in most leagues, like 12 team leagues and above as I think he could be a nice 2nd half value. Put him on your radars at least! Better in OBP/OPS leagues, but low ceiling still. The Reds (Winker included) are quietly one of the best offenses in baseball. There’s value up and down that lineup, and a lot of their players are underowned. Adam Duvall (10%), who has a terrible batting average, still somehow has 13 HRs and 53 RBIs. He’s a hot streak candidate down the stretch. Scott Schebler (22%), has more runs scored than Anthony Rendon in 30 less ABs. s---, even Tucker Barnhart (29%) is at least not a black hole at catcher. billy Hamilton, who does not know how to hit or get on base, has still scored 44 runs hitting 9th. all of which is to say, cheers Reds, for being so bad for the first 35 games that everyone forgot about you. On to Winker, the Reds fan base at Redsreporter love this guy, even though his defense is suspect. Jesse Winker – I think it was Eno Sarris I heard describe Winker has “Joey Votto in the outfield,” and given his amazing plate discipline this year (15.1% walk rate, 14% strikeout rate), I can see the comparison. Obviously, Winker doesn’t have the power Votto does, but that plate discipline makes him valuable, especially in OBP leagues. This week, the Cincinnati Reds will see nothing but right-handed pitchers this week, and so far this year, he’s slashing .298/.398/.420 against righties. He’s available in 85% of leagues, so pick him up. Clevinger bauer Carrasco. 3 tough guys to start. Not sure I am buying this week. Idk. The Reds are hot and this is the battle for Ohio. Agreed with this post wholeheartedly. I think folks are seriously underestimating what Winker is providing because of the frustrating playing time split right now with four guys for three spots (though I could see the Reds ship out Duvall at the deadline perhaps) and because of what the season stats look like (no power, no speed). Reality is that five of Winker's six HRs have occurred since June 7th. So basically, the last month has seen him hit five HRs (four within the past 30 days), but guys are still treating him like he's this no power hitter. Over the past 30 days he's hitting a cool .296 (.361 over the past two weeks) with a .419 OBP. Four HRs a month is a 24 HR player over the course of a season. Five a month is a 30 HR guy. I wouldn't be at all surprised to see Winker have a tremendous second half.